Some cooks are so legendary that when you see them in the flesh you truly do quake in your boots. For my mother, waitressing at Legal Sea Foods in Cambridge, Massachusetts, in the 1970s, that cook was Julia Child. Mom was asking a fishmonger how to cook a roast she’d just bought. He laughed, pointed, and said, “Ask that lady!” My mother turned, and there was the six-foot-two PBS host, trilling away about how to do right by a nice roast. Mom will never forget it. Octogenarian Madhur Jaffrey, the doyenne of Indian cuisine, proved just as daunting for me. The bespectacled Ms. Jaffrey is diminutive in stature, but when she quietly glided by me at a recent culinary conference, I flattened myself against the nearest door. Her book An Invitation to Indian Cooking, edited by the famous, late Knopf editor Judith Jones, was a game-changer, opening the door to homemade Indian food for American cooks of every heritage. I’ve recently restocked my pantry so I can cook Indian dishes more often. I bought turmeric, that wonderful jerk among spices. (Though it is likely healthy, it will also stain anything and everything it touches except glass—including your hands.) I started mixing my own garam masala. I invested in some vadouvan, a lovely golden mix of spices. I was sure to have good cumin in both powdered and seed form. And I always have tomatoes, cilantro, and fresh ginger around. Turns out you only need half of those ingredients (which you can find online) to make one of the most delightful dishes in Jaffrey’s book Quick & Easy Indian Cooking. 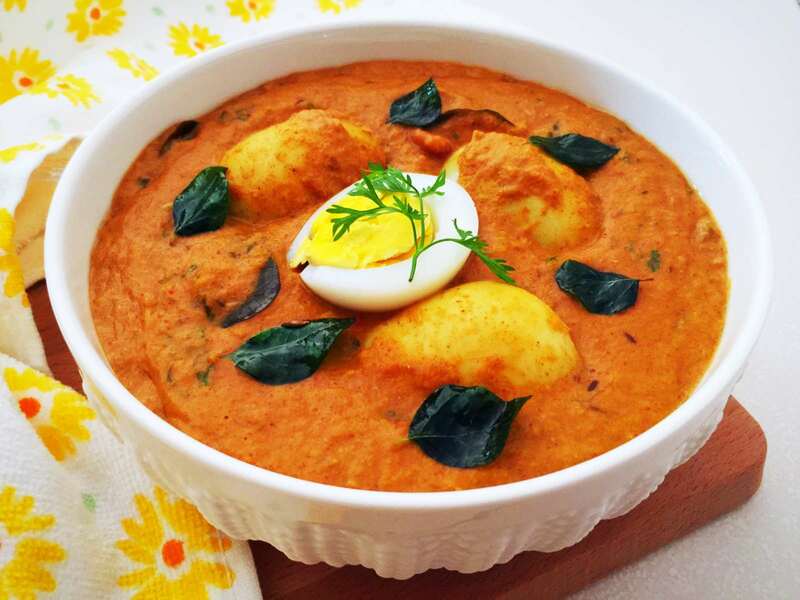 “Hard-boiled eggs masala,” or masaledar ublay unday, requires only staples—including hard-boiled eggs, which you can prep well in advance. The most exotic ingredient the dish contains is half a teaspoon of cumin seeds. And folks, it is ready in 20 minutes. Really. I’d be lying to you if I said I didn’t sometimes employ the shortcut of picking up rice from the Chinese place across the street, but you can easily make fabulous rice using the “knuckle trick” explained here. This sauce will become a go-to because it’s cheap and truly only requires what’s kicking around. You need a few spices, fresh lemon juice, and a splash of vegetable oil, to which you add those cumin seeds. After frying them for 10 seconds, add the onion and a simple spice mix, and you’re off to the races. The cumin blooms in the oil and adds depth to the onions. When you add tomato and cilantro, you’re building on that booming umami base. The recipe calls for eggs as a final flourish of protein, but you could easily add leftover cooked chicken or pressed, firm tofu. The lemon and ginger add brightness to the spicy, savory tomato base—and you’ve just cooked something really good on a weeknight without breaking a sweat. This can be whipped up quickly for lunch or supper. The eggs may be served with rice or even bread (toasted or plain). Combine the cayenne, turmeric, ground cumin, ground coriander, lemon juice, salt, black pepper, and 1 tablespoon water in a small bowl. Mix. Put the oil in a medium-sized, nonstick frying pan and set over medium-high heat. When the oil is hot, put in the cumin seeds. Ten seconds later, put in the onion and ginger. Stir and fry until the onion turns medium brown. Put in the spice paste. Stir and cook for 5 seconds. Now put in the tomatoes and sugar. Bring to a simmer. Cover and simmer gently for 10 minutes. Put in the cilantro. Stir once or twice. 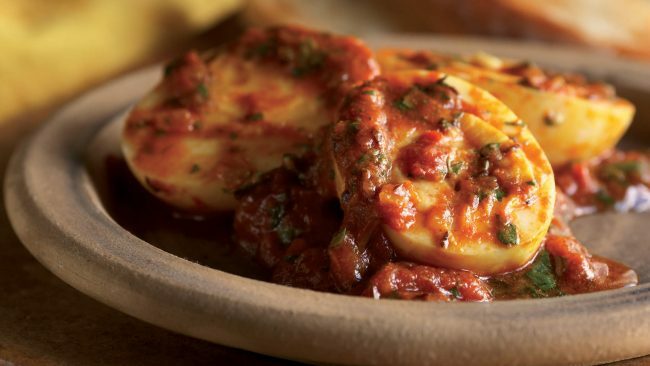 Lay the cut eggs in the sauce and spoon more sauce over them. Cover and simmer gently for 2 to 3 minutes.